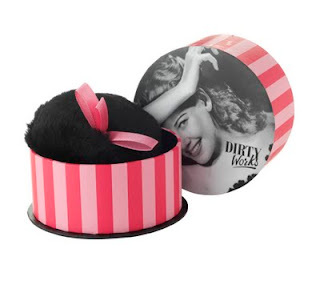 I'm not normally into talcs and powders with my favourite formula being oils but when the press release for this pretty puff from ﻿Dirty Works landed in my inbox, my attention was captured. The packaging is perfect, unashamedly girlie and simply screaming out for a vintage style dressing table. When I removed the puff from the cardboard tub, I was surprised at the lack of powder underneath- it turns out that the shimmer is ingrained within the puff itself. Pretty clever as it certainly helps to contain any mess. I really enjoyed the glamourous old-style ritual of applying the powder with the puff and loved the delicate, feminine scent. I had originally imagined the powder to be pale and irridiscent so I was surprised that it's gold and very glittery- definitely best kept for showing off a deep summer tan or for christmas party season. Personally, it verges a little too far on the glittery side for me but it would make a cute gift for a young teen. I didn't find the effects particularly long-lasting, even when I applied on top of thoroughly moisturised skin but for £5.99, you can't go wrong. Oh GOSH! It's Giveaway Time!